Adam West brought the field to the green flag for the 25 lap feature event. Holly Porter filling in for Glenn Styres in the 0 car momentarily lead the race in only her 4th 360 start before Jim Huppenen took over and settled into the top spot after starting 4th. Dylan Westbrook, who had locked up the SOS 2017 Championship the week before at Brighton Speedway had moved up to take over the 2nd spot and started reeling in the 14h of Huppenen. As the laps wound down Susice who had started 10th had worked his way around the outside of the track using his local knowledge from his many sportsmen races at Merrittville over the years. Coming out of 4 to take the white flag Susice again used the high side to pass both Huppenen and Westbrook down the front stretch and held on to win the race with the home town crowd on its feet in the grandstands. The Southern Ontario Sprints will co-sanction this weekend’s Canadian Sprint Car Nationals at Ohsweken with the Empire Super Sprints, Patriot Sprint Tour and Great Lakes Super Sprints. 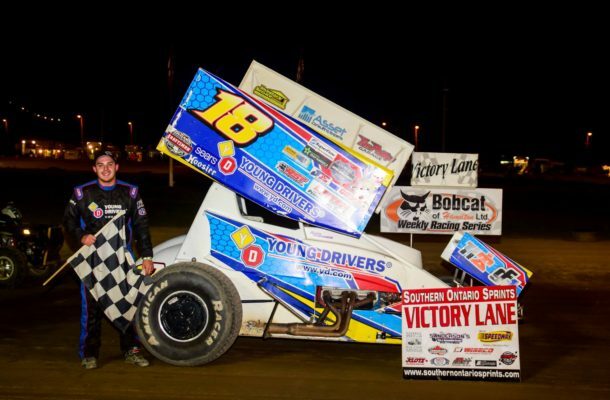 The event includes the Night Before the Nationals on Friday, September 15 before the $12,000 US-to-win Canadian Sprint Car Nationals on Saturday, September 16.